The first night of World Class competition at the Drum Corps International World Championships went to the Blue Devils (1st, 97.375), as the Cavaliers (2nd, 97.050) kept the Devils' lead to a small margin, and Phantom Regiment (3rd, 96.575) electrified an already enthusiastic audience at Indiana University's Memorial Stadium. Tonight's recap shows that the next two days could be a true photo finish for these three medalists, with astounding results across the board. The Cavaliers led the tied Devils and Regiment in total General Effect tonight by only 0.05 points, meaning the largest caption on the sheets is still very much up in the air. The Blue Devils received a perfect score in Visual Ensemble, and were only one tenth away from a perfect score in Visual Performance and in Color Guard. The result, once additions and divisions take place, means the corps received a total Visual score of 29.90, a mere tenth from another perfect score. First place in the Visual General Effect sub-caption and in Brass meant a first place finish for BD, but even then the corps was still only tenths away from the Cavaliers and less than a point ahead of Phantom Regiment in total score. The Cavaliers. Photo by Johnny Gilbert. 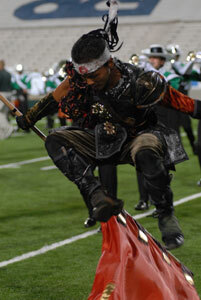 Cavaliers director Bruno Zuccala spoke about the corps being ready to go out and take their "Samurai" production as far as it can go during the World Championships. He said, "I think they've been prepared very, very well. Rehearsals have been going very strong and the final touches have been put on the show the last couple of days. Now we're just getting them to get that automaticity going and getting them to perform and have a great time doing it." And what are the Cavaliers hoping for over the next two nights of competition? Zuccala said, "To have the performance of a lifetime, that's what it's all about." The Cavaliers certainly had a strong showing tonight, receiving top honors in Music Ensemble, and also taking a slim 0.05 point lead in total General Effect. 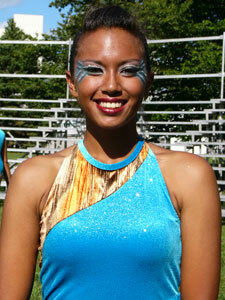 Phantom Regiment took first in Music General Effect. The corps also scored a 19.75 out of a possible 20 in Percussion tonight, which when combined with their second place finish in Brass was good for first place in overall Music. Carolina Crown (4th, 96.075) and the Cadets (5th, 94.225) were well received by the audience tonight, with the former getting cheers for their swelling brass finale and the latter for their blistering drill transitions. The audience also knew how to express their affection for the Santa Clara Vanguard (6th, 92.625) and the Bluecoats (7th, 92.175). Both the "Vanguard yell" and the traditional Bluecoats "Bloo" catcalls were out in force tonight, for just the first evening of the World Class World Championships. A close pack remains with the Blue Knights (8th, 88.425) placing ahead of the Blue Stars (9th, 88.100), while the Boston Crusaders (10th, 87.925) narrowly outscored the Glassmen (11th, 87.625). The Madison Scouts (12th, 85.075) passed the Crossmen (13th, 84.825), who were tailed by the Colts (14th, 84.450) and Spirit (15th, 83.350). Troopers (16th, 81.500) qualified for World Championship Semifinals for the first time in more than a decade, and Pacific Crest (17th, 79.350) became the last corps to qualify tonight. The Academy (18th, 78.850), Mandarins (19th, 77.925) and Pioneer (20th, 74.125) ended their seasons this evening. Speaking to members of those corps who were aging out, there were no regrets. "It went by way too fast," said Jordan Roddel, a bass drummer who's aging out after marching as a member of Pioneer for five years. "I'm the one that taps us off the field, and before I know it, suddenly our drum major's pointing at me to tap off the field and my first reaction is, 'I don't want to.' I wanted to stay on that field forever. Knowing that it was my last show I didn't want it to end." When asked why Pioneer is special to him, Roddel said, "It's just my family. When the 2005 season came along I was trying to figure out where I was going to march, and a couple of my friends convinced me to audition elsewhere, and before the camp even got there, I was like, 'This is wrong, I have to go back to Pioneer.' It's my home, I couldn't even imagine being anywhere else, and I'm just so thankful I'm aging out here." Akiko Mar, a member of the Mandarins color guard for the past nine years, said about aging out, "I don't think it's hit me yet. It kind of hit me after the run through this morning. The horn line plays 'The Year of the Dragon' and the age-outs stand in the center and they play that for us. It's very beautiful and very nice, that's why I was having a little teary moment." Mar has led a life filled with drum corps. She said, "It started out when I was 12, I was actually raised around the Mandarins by my father who brought me to practices, and I loved how the guard was—maybe it was the pretty flags or something. I really wanted to do it, and when I got a chance to it was like 'this is so cool, this is awesome.' I just wanted to be around what my father was around. But now I appreciate what being with the Mandarins has taught me and how it's helped me grow up throughout my nine years." Casey Ehrler is aging out with the Academy after four years with the corps, finishing his career as the trumpet section leader. He stressed making the most of his last days with the corps, and said, "I've been thinking about it for the last week or so especially, just trying to take in the little things. 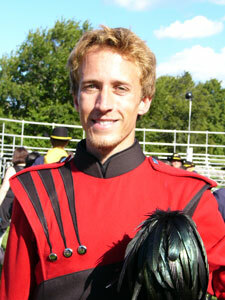 Like during rehearsal, how the grass feels under your feet, and how everything looks from under the brim of your shako. Just trying to maintain those little memories that I know I'll be able to carry with me forever. "When I started marching band in high school, I never thought that it would become such a huge part of my life as it is now," Ehrler said. "Now I'm a music education major, I teach marching band at high schools, and I plan on teaching marching band and drum corps for the rest of my life. So it's definitely been a very big experience for me, and I hope to stay in the activity and with this organization in particular for as long as I possibly can." Tomorrow will be a full day of drum corps for fans across the globe, with the Open Class Semifinals beginning at 8 a.m. and the World Class Semifinals stepping off at 5 p.m. Both classes' Semifinals will be broadcast with Fan Network Live Webcasts, available as pay-per-views but also included with a $39 Fan Network subscription. With tonight's results remaining as close as possible, fans who can't make it to Bloomington will want to get a taste of the action at Memorial Stadium.